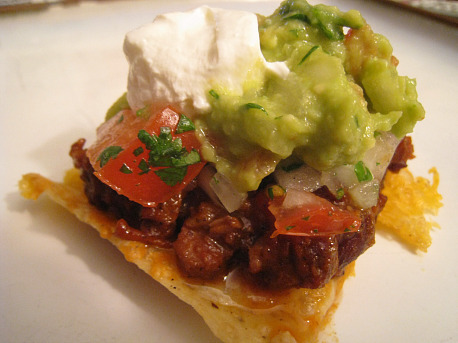 Still reeling from my recent loss in Chopped: The Home Game, but with bolstered confidence that I need not follow a recipe step by step in order to produce something interesting in the kitchen, I decided to make chili for our Superbowl nachos without reference to any cookbooks. “What’s the worst that could happen?” I figured. Chips with cheese, salsa, guacamole, sour cream and no chili. I think that’s a worst-case scenario I could live with. Only the tip of Hmart's shortrib iceberg. But enough with the chile. Now to the chili. When I’ve made chili in the past, I’ve always done a riff on a friend’s recipe that incorporates ground beef and two varieties of sausage, but the short rib looked too good to risk overpowering it by anything else. And even though my cooking experience isn’t huge in the scheme of things, the idea for the recipe came together easily and simply from a few dishes I’ve made before. The traditional, uh, Texan basquaise. Here were the basic ideas: start with the Eric Ripert basquaise I had made with the cod. I thought the concentrated pepper, wine, prosciutto, and garlic flavors would be a great flavoring base to start. 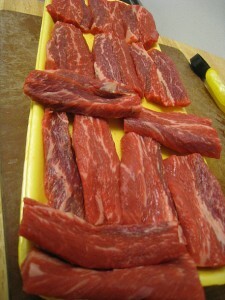 Then I would cut the short ribs into several-inch pieces, sear it, and braise it. I’d use more red wine as I’ve done with tomato sauce, and finally, I’d squeeze in some lime juice like I did with a Yucatan Pork Stew (not yet posted). I kept the basquaise on the side and proceeded with the beef. I cut it into approximately three-inch pieces, and after seasoning both sides of the with salt and pepper, I browned in the Dutch oven. I then chopped the meat into small pieces and added it back to the pot, along with the basquaise, a can of plum tomatoes, a can of black beans, more red wine, and (drum roll, please) the seasonings. 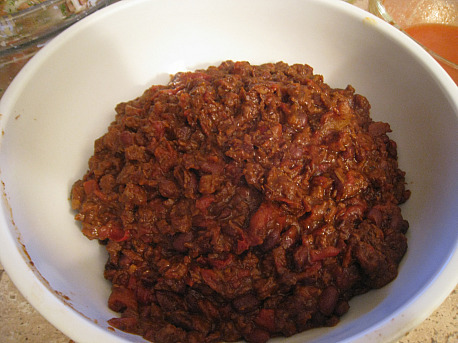 Chili, it turns out, has got to be one of the easiest dishes to experiment with. As opposed to judging the seasoning to add to uncooked meat, with chili you can taste as you go. The seasonings I chose to go with were: ground cumin seed (the smell instantly screams “chili”), a pinch of cloves, and a pinch of coriander. For the latter two, I figured a pinch (i.e., the “a pinch” measuring spoon) was about as little as I’d want to add, so I just dumped those in. The cumin, on the other hand, was weaker than I expected, so I added a half-teaspoon at a time until I was satisfied with two. After bringing the mixture to a boil, I turned down the heat to low (just a few bubbles coming up), put the lid on, and let it cook. The time (which I didn’t count) was probably an hour or so, but I was simply waiting for the meat to get tender. One disappointment was that in the final minutes (while it waited for our other Superbowl cuisine to come together), the liquid in the sauce that was so good evaporated into thin air. The chili wasn’t dry by any means, but I did miss the sauce. I also think that maybe even the pinch of coriander was too much. Still, I give it a thumbs-up. But here’s how it was meant to be served: with homemade salsa (Karen) and guacamole (yeah, she made that, too). The sour cream was my idea. In case you're wondering: yes, there was too much crap on this chip. Using a deep Dutch oven, saute the garlic and onions at medium-low for a few minutes to soften. 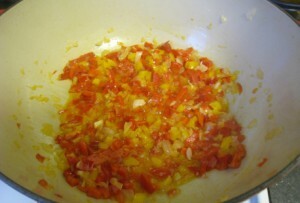 Add the bell peppers and chile pepper and saute until the pepper is extremely soft. Taste at your own risk. Now, you could probably add the prosciutto earlier if you remember to, but if you’re me, you add it after the pepper is tender, push the pepper to the side of the pot, and slightly crisp up the pieces for a minute or two. 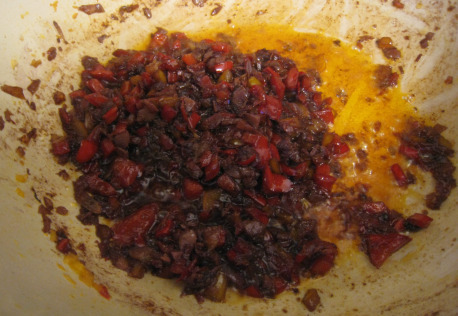 Add the red wine and season with cayenne, then continue cooking until the liquid from the wine is nearly evaporated. Put the finished mixture in a bowl and set aside. As the mixture is coming to a boil, add the cumin, cloves, coriander, lime juice, and Melinda’s hot sauce. (The latter two ingredients are important to give the chili a nice tang.) Lower the heat to low (just a few bubbles coming up), cover, and simmer until the meat is tender, approx. one hour. Oh, and turn off the heat while you still have some sauce! My advice would be to take the cloves and coriander down a notch, but other than that, I’d recommend it for eating. Which I guess is a good thing, considering I took the time to write up the freakin’ recipe. But have fun. And definitely wing it.